1982 was the Nike Womens Air Force 1 debut and even though the shoe is made for basketball, it is more of a shoe for "style". In 1982 when they first released, the Nike Air Force 1 was the first model to have Nike Air technology. In the 1980's the Nike Air Force 1 was popular like they are till this day. 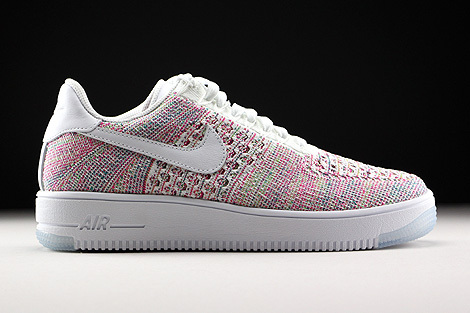 This version of the Nike WMNS Air Force 1 Flyknit Low comes this time in a White and Radiant Emerald colourway. It is made out of smooth flyknit fabric with a great white midsole and a white + clear outsole, white laces and a white swoosh. The heel area is also white. Comes with silver Nike Air Force 1 lace tips. This is a must have for all seasons.